Spanish Golden Age Religious Painting: Flemish Influence. An overview of art in Spain’s Golden Age (in general terms the 16th and 17th centuries) shows that the vast majority of paintings produced were religious, and that most were sponsored by the wealthiest institution in the country: the Catholic Church and its affiliated monasteries, convents etc. Although there were plenty of Spanish artists engaged in painting works for the Church etc., they were frequently overlooked in favour of foreign painters during the last third of the 15th century and into the 16th, especially those from Flanders and Italy. That Italy should figure prominently is not unexpected, given its already established leadership in so many cultural branches of the Renaissance. However, what is more surprising is the large number of painters from northern Europe, especially Flanders, active in Spain. How did this come about? The explanation for this can be traced back to important commercial contacts between Castile and Flanders in the late Middle Ages (14th and 15th centuries)**. 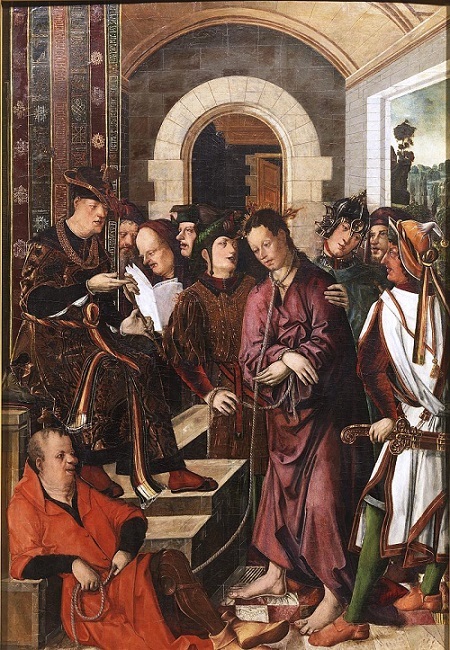 Castile was a major exporter of wool for Flemish looms; in return, Castilians bought finished goods from Flanders, including tapestries, sculpture and paintings. With these goods came a steady traffic of Flemish architects, sculptors and artists as visitors or migrants to work on various churches or the great cathedrals of Burgos, Toledo and Seville. Paintings and engravings were also sent or imported and then copied by artists in the Peninsula. **The commercial contact was strengthened in the 16th century by political bonds when Charles I of Spain (V of the Holy Roman Empire) succeeded to the throne in 1516. Grandson of the Catholic Monarchs, Ferdinand and Isabella, Charles was born in Flanders, spoke Flemish, did not arrive in Spain until he was 16 years old and actually spent most of his reign travelling the vast territory in Europe that he inherited from his Hapsburg father. A further and important factor was the pervasive presence of Gothic style (more often associated with architecture and sculpture) that originated in the northern Europe and spread widely in Castile and the Kingdom of Aragón, which included Catalonia and Valencia. 3. The Role of Royalty. Royalty played a very active role in furthering the popularity of Flemish painting. For example, in the 15th century both Juan II of Castile (1405-54) and Alfonso V (1396-1458), King of Aragón and Naples, collected works by Roger van der Weyden, one of best-known Flemish painters of the time. Alfonso V also entertained as early as 1428 Jan van Eyck –arguably the most influential Flemish painter of the 15th century. And in 1431, Alfonso’s court painter, Lluis Dalmau, travelled to Flanders possibly on a mission for the king but also to acquaint himself with the works of the Flemish masters. Queen Isabella of Castile (she and her husband, Ferdinand, are together generally known as the Catholic Monarchs) had several paintings by Flemish and German artists in her collection, many of which can be seen in the sacristy of the Royal Chapel in Granada (where she and Ferdinand are buried). Furthermore, she invited two northern painters –Michel Sittow (1468-1526) and Juan de Flandes (?-1519) — to serve as court painters. The endless travels of Charles V (r. 1516-56) seem to have restricted his activity as a collector but his sister, Queen Mary of Hungary, was a keen collector. Their joint collection passed to Charles’s son, Philip II (r. 1556-98), the most prolific art collector of the 16th century. He is estimated to have personally amassed about 1,000 works and at his death had approximately about 1,500 paintings in his collection, including numerous Flemish works (Philip particularly admired the enigmatic Hieronymus Bosch, who lived from about 1450 to 1516). What was it that made northern paintings so popular in Spain? It was undoubtedly their emotional intensity, drama and deep religious feeling combined with meticulous realistic details. These complemented the Spanish, and especially Castilian, mind-set for realism evident, for example, in major literary works such as the Poema de mío Cid ca 1200, the Libro de buen amor (Book of Good Love) ca 1343, La Celestina 1499, and Lazarillo de Tormes (1554). Where Italian religious painting tended towards idealisation with serene, classical settings and/or arcadian landscapes, Flemish painting was more attracted to the small details of daily life (e. g. the interior of a building) often set against Gothic or Romanesque backdrops and/or dramatic landscape background. Flemish painting was influenced by the rise of a mercantile class which, with its new found wealth sought works on a smaller scale for household worship. Often, too, patrons demonstrated their status, as well as their piety, by having modest portraits of themselves in prayer on side panels of triptychs or even within a single painting. Important, too, Flemish painters had mastered the technique of using oil which allowed endless reworking of a painting and greater and more realistic detail. Both Flemish and Italian styles had wide appeal in Spain, and thousands of paintings reflect this. Although some artists signed their works, many paintings were in fact anonymous and now lie in relative obscurity in churches (or museums) scattered throughout the country. Only the most original artists find their way into general art history books, and these usually begin with painters of the second half of the 16th century starting with El Greco (1541?-1614, born Domenikos Theotokopoulos) and ending in the 17th with Diego de Velázquez (1599-1660). The influence of Flemish painting dominated in Spain in the 15th century and into the early 16th. The main areas where this influence was felt were Castile (especially Burgos and Palencia), and Catalonia and Valencia, i. e. the Crown of Aragón. The widespread presence of Flemish painters and the importation of art works and engravings from Flanders which were then copied by local artists or inspired them have given rise to the term Hispano-Flemish Painting. The designation is not universally recognised (some critics prefer Late Gothic), but it seems appropriate when referring to Flemish painters practicing in Spain, or Spanish artists influenced by Flemish painters, or by copies that found their way to Spain. What follows is by no means an exhaustive analysis of Flemish influence on Spanish painting. Rather, the aim is to offer some guideline or template to what we see as characteristics of Flemish painting which appeared in Spanish art at the end of the 15th century and into the early years of the 16th. Although artists of religious works were often constrained by specific demands by the clergy or secular sponsors, their canvases might still carry individual touches. But that is for experts or art historians and we are not experts. In the following observations, limited to five artists, we try to identify the kind of details that characterise a painting as Flemish within our generalisation above: emotional intensity, drama and deep religious feeling combined with meticulous care for small details often drawn from daily life, and frequently set against Gothic or Romanesque locations or a dramatic and often contrived landscape background. Let’s take first the central panel of an altarpiece triptych by the Flemish artist Roger van der Weyden (ca 1400-1464) in the Miraflores monastery near Burgos. The altarpiece was donated to the monastery by Juan II of Castile in 1445. The central panel is a Pietà, a depiction of the Virgin Mary weeping over the dead body of Christ, her Son. This was a very popular subject in the 15th century, reminding worshippers of Christ’s sacrifice and intended to elicit feelings of compassion. Roger van der Weyden. Pieta. The composition is characteristically Flemish: the figures in the foreground are set against a receding landscape giving a sense of perspective. In this case, the landscape is a detailed northern setting of hills, trees, and a lake lapping the towers and outer walls of a town. Such a setting is an anachronism, but in paintings depicting a Pietà or the Crucifixion, it was common to transform the historic Jerusalem into the landscape of a northern European town. The scene is framed in an arch containing delicately worked and exquisitely detailed Gothic miniatures depicting New Testament scenes preceding Christ’s crucifixion. Flemish too are the gaunt, angular body of the lifeless Christ, the chiselled/ heavy folds of the robes, and the marked contrast between the red of Mary’s robe and the blue of the young John the Baptist. Outlines and contours are clear and bold, with the cross standing starkly in the middle of the picture. The weeping Mary, cradled over the gaunt body of Christ, and the comforting, supportive gestures of the young John the Baptist and his companion capture realistically the emotion of the moment. Much in the Flemish style, the whole scene has photographic precision. 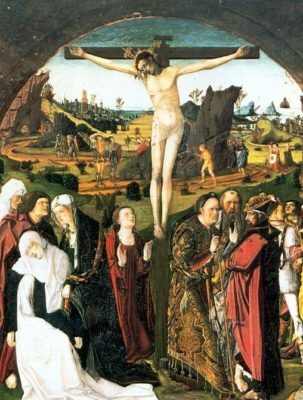 The contemporary setting may well represent the universality of Christ’s suffering, which was as relevant in the 15th century as it was at the time of His death. A second example by a Flemish artist comes from Juan de Flandes. Flandes arrived in Spain in 1496 at the invitation of Queen Isabella. After her death in 1504, he moved to Salamanca and in 1509 settled in Palencia. 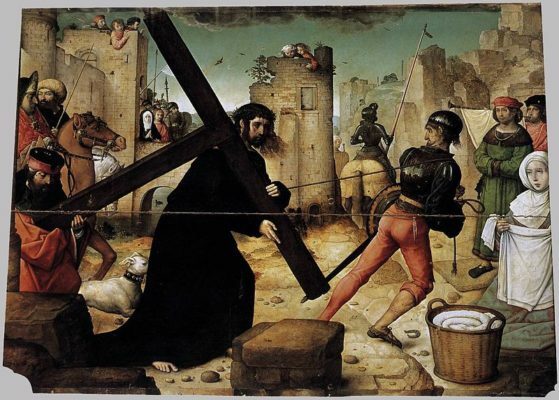 Christ carrying the Cross (1509) was painted for the high altar of the Cathedral of Palencia and donated by Juan Rodríguez de Fonseca, Bishop of Palencia. Fonseca was a prominent figure in the court Ferdinand and Isabella and had visited the Netherlands in 1505, bearing news of Isabella’s death to her daughter Juana and son-in-law Philip. Juan de Flandes. Christ carrying the Cross. The painting is a dramatic rendering of a poignant moment as Christ is pulled on his way to Calvary. Outlined entirely in black against the pale walls of Jerusalem, he is the only figure who looks directly at us, drawing us into the picture. The heavy Cross, also in black, cuts diagonally through the picture, forcing Christ to stoop forward, thereby awakening our compassion. The setting is contrived and anachronistic: the clothes of the jailor and others belong to the 15th-16th centuries, and the walls of Jerusalem are reminiscent of Medieval fortifications, complemented by the knight-in-armour facing away from us on horseback. Human and animal figures are sharply defined, and together with the variously coloured clothes against the paler walls of Jerusalem give the picture a sculpted quality frequent in northern art. There are several excellent realistic details i. e. “realism of particulars“: the individual faces (especially of the helmeted jailor), the common touches rooted in daily life: the laundry basket with a freshly laundered sheet, the dog, the discarded horseshoe by the laundry basket**, the curious children peering down from the top of the walls. There are tufts of vegetal growth on the walls beside the children, scattered stones on which the barefooted Christ might tread painfully and tiny ducks in the water and beneath the bridge behind Christ. The setting and figures in contemporary clothing remove the Crucifixion from the Middle East and Christ’s time to the 15th century, as if to remind us of His ongoing suffering for our salvation. **The laundress to the right has been identified as St. Veronica who, according to Catholic tradition, offered Christ a cloth to wipe his sweating brow as He made his way to Calvary. Depicting her as a laundress was a clever way of explaining how she came to have a cloth. The legend was very popular from the 13th through the 15th century, when St. Veronica’s veil was on public display. Spanish painters of the period were not indifferent to these new works showing lifelike figures set in clearly defined three-dimensional space as opposed to the stiff, stylised figures against a flat space of earlier art. 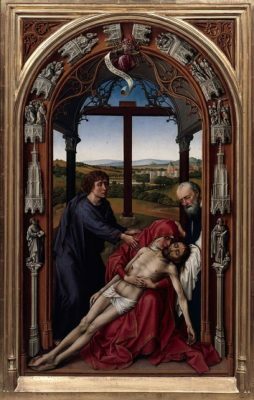 Fernando Gallego’s Pietà (ca 1470), now in the Prado Museum, Madrid, offers a useful comparison with Van der Weyden’s work discussed above, and was probably inspired by it. Little is known of Gallego’s life (ca 1440-1507) but he appears to have been from Salamanca, Castile. There are original touches in Gallego’s work: notably the reversal of the figures of the Virgin and Christ; the elimination of the intricate architectural framework, which thrusts the Virgin and Christ and the cross prominently to the forefront; the incongruously small image of the unknown donors inserted to one side; the removal of John the Baptist and his companion (leaving the faithful to focus exclusively on the Virgin and Christ); a rocky, hard contoured landscape which is bolder, harsher and more dramatic than Van der Weyden’s version. 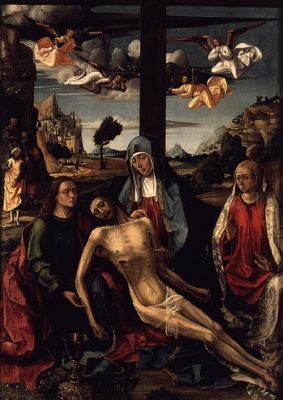 Although original, these touches are based on a Flemish template of long, angular bodies, the diagonal positioning of Christ cradled by His weeping Mother, and the detailed but unrealistic landscape background with walled city. Flemish too the angular folds of rich blue cloak covering the Mary and the contrasting red underskirt she also wears. Bartolomé de Cardenas better known as Bartolomé Bermejo (ca 1440-ca 1500), was active as painter in Valencia, Zaragoza and Barcelona. His best-known painting, a Pietà with St Jerome and Archdeacon Lluis Desplà (1490), captures the meticulous detail and realism of Flemish art. Almost as important as the four figures in the foreground is the turbulent, hard-edged mountainous landscape with the cross and the walled city behind them. It’s a typically northern landscape in its detail and clear-cut contours, and a sense of perspective provided by the smaller objects in the background and the winding path to the right. Details abound, from the elaborate edging of Mary’s cloak to the churches dotted in the mountainous terrain and the greenery scattered throughout. It is a lavish, opulent painting, with a powerful “edge” to it to grab our attention. The Valencian Rodrigo de Osona (1440?-1518?) worked mainly in Valencia, although he may also have visited Italy. Rodrigo de Osona. Christ before Pilate. A painting from the Prado Museum, Christ before Pilate (ca 1500), suggest a strong Flemish influence in the vivid colours, the detailed presentation, the weighty albeit incongruous brocade and flamboyant hat worn by Pilate, and the heavy tapestry hanging behind him. Like Pilate, the other figures wear clothing of the 15th/16th centuries, more appropriate for a northern climate than the Mediterranean. 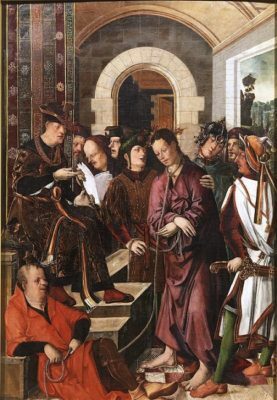 The facial features are highly individual and expressive, some in conversation, one leafing through notes and Pilate seemingly unsure about the man standing accused before him. In the midst of this busy activity, the bare-footed Christ stands passively, looking down, his hands tied, his neck attached to a rope held by a casually seated, bulbous-nosed jailer whose twisted grin suggests that he is enjoying the whole process. To the right, a stylishly dressed figure, with hand on a sword, projects a flamboyant air. What makes this painting real is the lack of conscious posing. The group behave as if unaware that they are being painted, and Osona has caught them going about their business. The trial takes place in a Romanesque-style building with a hint of a rocky, northern landscape through the window to the right. Rodrigo de Osona. The Crucifixion. 1. Christ projected against a detailed, implausible landscape, 2. to the left, the drama of the Virgin, who has fainted, and 3. to the right, three elaborately –and anachronistically– clothed Jews in conversation and seemingly unconcerned about events around them. The composition is very much Flemish in its minute details, hard contours, the meticulous rendering of the clothes, Christ’s thin and elongated body, and the rocky, surreal landscape reminiscent of Hieronymus Bosch (ca 1450-1516). With attention shifting between the three parts, Osona’s Crucifixion is hardly a serene interpretation, but its sense of drama would have appealed to Spanish worshippers. Although the influence of Flemish painting dominated during the 15th century in Spain, by the turn of the 16th century it had to compete with the increasing influence of Italian painters. In many instances, there are overlapping influences from both sources. Let’s take just one example: Rodrigo de Osona Pietà (ca 1500). 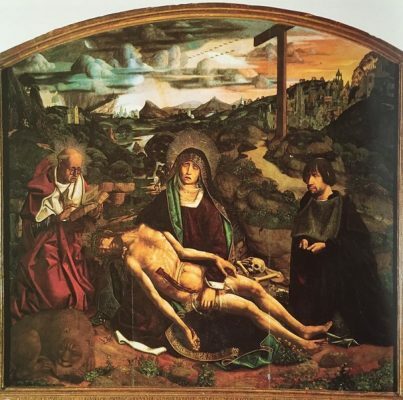 Like his Christ before Pilate (above), Osona’s Pietà, in Valencia’s Museu de Belles Arts, is a busy painting, not however based on individuals going about their business, but on a canvas filled with different perspectives and vivid colours. 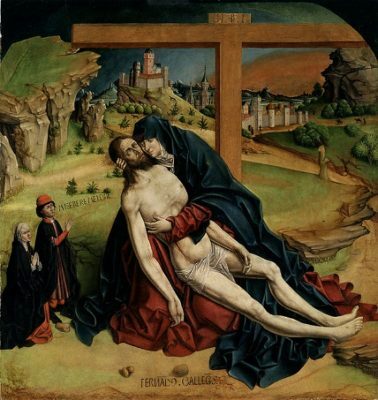 In many ways, this Pietà is a hybrid of Flemish and Italian practices. In the foreground, the triangular arrangement of Mary and her two companions (possibly Mary Magdalene to her left and John the Baptist to her right) echoes similar arrangements in Italian Renaissance paintings. Italianate too are the four angelic hosts in flapping, heavily folded gowns, awaiting Christ’s soul amidst swirling clouds. But the landscape, the sharply-edged contours and the sharp details betray Flemish influence. Look for the man carrying the ladder (the one used to lower Christ?) on the path, or the rich edging on Mary’s cloak or the intricate designs on Mary Magdalene’s robe to the right. The young Christ’s gaunt, bleeding angular, almost skeletal body, with pronounced rib cage and bony arms and legs aimed to stir compassion belong very much to northern paintings. Harbison, Craig “Realism and Symbolism in Early Flemish Painting,” The Art Bulletin Vol 66. No. 4. Dec. 1984. Pp. 588-602.
https://www.wga.hu/tours/spain/p_14_15.html#hispano A useful summary of Hispano-Flemish painting.